Well it has not been as long between furniture projects as the last time but still a bit. This time I am working on my ottoman. I have finished assembling the frame this evening and plan to work on the finishing and the upholstered top this week with a little sewing help from my wife. Here is here a few pics of what has happened so far. The paper you see at the top are my basic plans. I am really bad at plans, this or a general layout in PowerPoint are how I do most of my planning. From there I just work in the basic dimensions and do a lot of the math as I go. 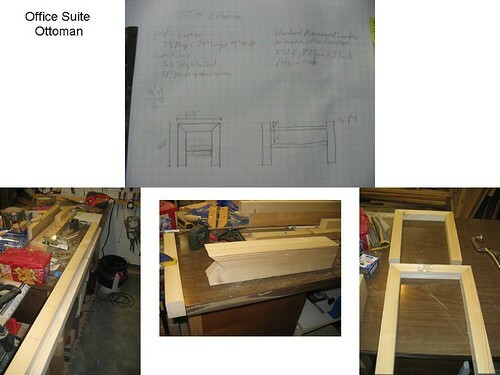 The stock and then the first miter cuts are also shown as well as layout before assembly. Assembled legs. 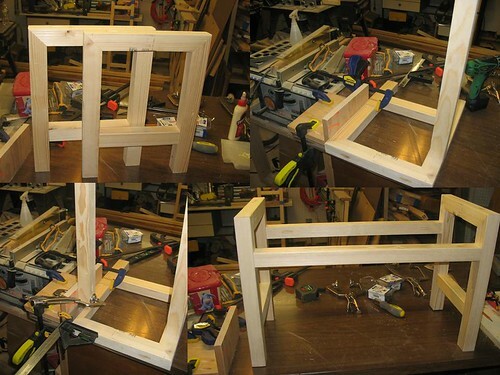 What I have started calling my “accidental jig” I made this a while back when I first got my Kreg Jig just to see how things worked, it has since been used for clamping and measuring and glue ups. All wood is again dimensioned 2×4s and the joints are all pocket hole with the Kreg jig. I’ll post the final hopefully by the end of the week. Will it be leather or some other material? Sandhill, The covering is up for debate. We have a piece of Suede as well as some nice upholstry fabric that we bought on clearance somewhere. Will probaly look at both the tonight. Right now DW is focused on a different sewing project.